Moong Dal Chakli also known as a murukku. Moong Dal Chakli is a popular snack all throughout India. Moong Dal Chakli is a crispy and delicious snack that is prepared for festival. Making Chaklis at home is a little time consuming but I promise it will turn out much better than the store-bought ones. It is perfect with a hot cup of Chai. There are so many ways to make chakli like bhanjani chi chakli, rice flour chakli, etc…I used moong dal, rice flour and maida combination. It tastes so good and very similar to traditional bhanjani chakli. Its soft and crispy…perfectly done, so delicious and addictive that you just can’t stop at one. Challi is also one of the most popular snack during Diwali. 1. Rinse moong dal 2-3 times then pressure cooker it with 3/4 cups of water and cook until 2-3 whistles, keep aside and let it be cool down. 2. Take maida in the small steel container (use pressure cooker container), cover it using plate then place it into the same pressure cooker and steam for 10 min without whistle and then let it be cool down. 3. Remove it from the cooker, break it using a spoon and then sieve the steamed maida using a fine strainer into the mixing bowl. 4. Now add rice flour, boiled moong dal, oil and all dry spices in it, mix well and make stiff but soft dough, use ¼ cup water as needed. 5. Put the dough ball in the chakali mold and start to make chakali on a tray or paper. Use remaining dough to make more chakli. 6. Heat oil into the deep pan and deep fry the prepared chakli until golden brown. Fry all chakli in small-small batches. 7. Place the fried chakli on paper towel and let it be cool down completely, then store it into the airtight container. • If you don’t have chakli mold, then use icing or piping bags using star nozzle. • Do not over fry chakli else it tastes brunt. Moong Dal Chakli also known as a murukku. Chakli is a popular snack all throughout India. 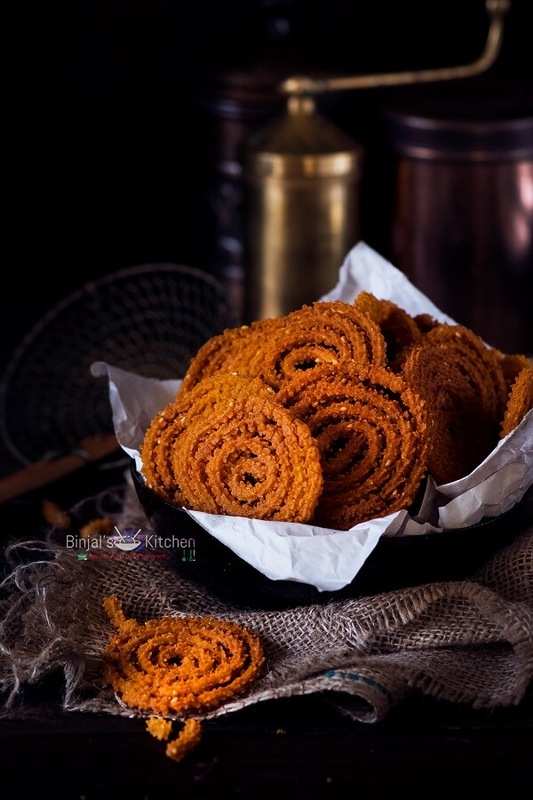 Chakli is a crispy and delicious snack that is prepared for festival. Making Chaklis at home is a little time consuming but I promise it will turn out much better than the store-bought ones. It is perfect with a hot cup of Chai. Rinse moong dal 2-3 times then pressure cooker it with ¾ cups of water and cook until 2-3 whistles, keep aside and let it be cool down. Take maida in the small steel container (use pressure cooker container), cover it using plate then place it into the same pressure cooker and steam for 10 min without whistle and then let it be cool down. Remove it from the cooker, break it using a spoon and then sieve the steamed maida using a fine strainer into the mixing bowl. Now add rice flour, boiled moong dal, oil and all dry spices in it, mix well and make stiff but soft dough, use ¼ cup water as needed. Put the dough ball in the chakali mold and start to make chakali on a tray or paper. Use remaining dough to make more chakli. Heat oil into the deep pan and deep fry the prepared chakli until golden brown. Fry all chakli in small-small batches. Place the fried chakli on paper towel and let it be cool down completely, then store it into the airtight container. • If you don't have chakli mold, then use icing or piping bags using star nozzle. The chakli looks soo yum! gorgeous shots binjal! loved it!